Check out the Scottish Highland Cattle while staying at the Bailey’s Bed ‘n Bale. Highland cattle: They are a Scottish cattle breed. They have long horns and long, wavy, wooly coats that are colored black, brown, yellow, white, gray, "silver" (white but with a black nose and ears), or tan, and they also may be brindled. Highlands are raised primarily for their meat. They originated in the Highlands and Outer Hebrides islands of Scotland and were first mentioned in the 6th century AD. They are a hardy breed, having been bred to withstand the conditions in the Scottish Highlands. Their long hair gives the breed its ability to overwinter. Bulls can weigh up to 1,800 pounds and cows can weigh up to 1,100 pounds. Their milk generally has a very high butterfat content, and their meat, is gaining mainstream acceptance due to being lower in cholesterol than other varieties of beef. 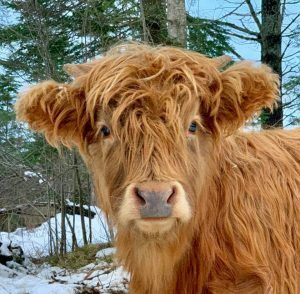 Highland cattle have been described as "almost as cold-tolerant as the arctic-dwelling caribou and reindeer".